Turkey wants the United States to disarm Syrian Kurdish forces it has trained and supplied for the fight against the Islamic State, and to provide air and logistical support for Turkish troops and allied Syrian opposition forces who plan to pick up the anti-militant battle after a U.S. withdrawal. The list of Turkey’s “concerns and expectations” will be conveyed next week to White House national security adviser John Bolton when he visits Ankara to explain the still-unspecified U.S. plan for a withdrawal from Syria, according to Turkish officials. Bolton’s trip comes as Secretary of State Mike Pompeo is also heading to the region to try to persuade Arab partners and allies that “the United States is not leaving the Middle East. Despite reports to the contrary and false narratives surrounding the Syria decision, we are not going anywhere,” a senior administration official said Friday in a briefing for reporters. U.S. strategy was thrown into confusion last month, when President Trump announced the immediate withdrawal of some 2,000 U.S. troops from Syria. For the past three years, those forces have advised and directed Syrian Kurdish fighters who, with the aid of U.S. airstrikes, have driven the Islamic State out of most of its Syrian strongholds. Trump’s decision followed a Dec. 14 telephone call with Turkish President Recep Tayyip Erdogan in which they agreed that Turkey should take charge of the anti-Islamic State fight and management of territory seized from the militants. Bolton subsequently enshrined the new policy in a classified memo directing the departure of U.S. military forces from Syria and shifting of responsibility to Turkey, said a person familiar with the process. That person, along with several U.S. and foreign officials, spoke about the still-unsettled situation on the condition of anonymity. Whether U.S. airstrikes in Syria will continue at their current pace, in the absence of direct American guidance to ground forces of the Kurdish People’s Protection Units, or YPG, is one of a number of unresolved issues. In an update issued Friday, the U.S. Central Command listed a total of 469 strikes conducted against the Islamic State in Syria between Dec. 16 and 29. For now, “our policy remains the same,” a military official said, although “adjustments” are expected as the troop withdrawal is undertaken. 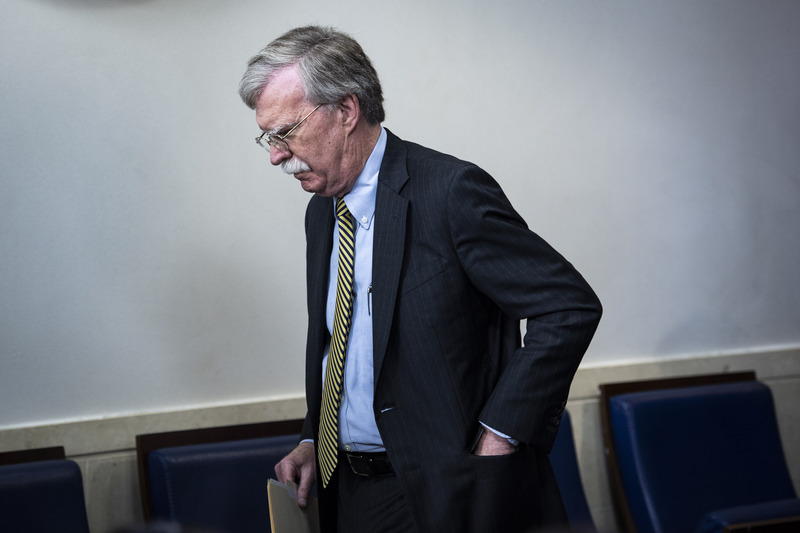 Bolton will be accompanied to Turkey by Gen. Joseph F. Dunford Jr., the chairman of the Joint Chiefs of Staff, and James Jeffrey. Jeffrey, a former diplomat who last summer was appointed special administration representative for “Syria engagement,” was named Friday to replace Brett McGurk as the envoy to the global anti-Islamic State coalition. McGurk and Defense Secretary Jim Mattis announced their resignations last month in protest of Trump’s Syria withdrawal decision. Pentagon and State Department officials are skeptical that Turkish forces are capable of combating the Islamic State, whose reduced forces are now far into southern Syria near the Iraqi border, or that Turkey will prioritize the militants over its stated desire to eliminate the Kurdish YPG forces. Turkey considers the YPG a subsidiary of the Turkish Kurdistan Workers’ Party, which both Ankara and Washington have designated a terrorist organization. It has objected from the start to the U.S. use of the Syrian Kurdish fighters as the primary ground force in the U.S. efforts against the Islamic State. Turkey’s complaints have grown as territory cleared of the militants has been left in the hands of the YPG, which has declared a Kurdish enclave along the Turkish border. Last month, even as he was negotiating with Trump, Erdogan said Turkish troops and their Syrian opposition allies were mobilized along the northeastern Syrian border and ready to attack if the United States did not disarm and remove the Kurds. The threatened invasion has been postponed, Turkish officials said, until departing U.S. troops get out of the way. Erdogan expects to learn the timetable for their withdrawal during Bolton’s visit. While Trump has been said to have extended his initial 30-day deadline to four months, “we have no timeline for our forces to withdraw from Syria,” said one of four senior administration officials who participated in the briefing for reporters Friday. They spoke on the condition of anonymity under White House rules for the briefing. Trump’s agreement with Erdogan comes as the administration is seeking to resolve a number of issues with Turkey, a NATO ally. Late last month, the United States approved a $3.5 billion sale of Patriot surface-to-air missiles to Turkey, hoping to head off Ankara’s purchase of a Russian air defense system. Meanwhile, Pompeo’s trip to the region will take him to at least eight countries, including all six members of the Gulf Cooperation Council — Saudi Arabia, Kuwait, the United Arab Emirates, Qatar, Bahrain and Oman — as well as Egypt and Jordan. Officials said Pompeo also plans in Saudi Arabia to bring up the case of Saudi journalist Jamal Khashoggi, who was killed by Saudi agents inside that country’s consulate in Istanbul on Oct. 2. Trump has resisted U.S. intelligence conclusions that the killing was likely ordered by Crown Prince Mohammed bin Salman, the de facto Saudi ruler. Saudi officials said this week that 11 people, who have not been identified, are on trial in Riyadh for the killing, and that the death penalty is being sought for five of them. Karen DeYoung is associate editor and senior national security correspondent for The Post. In more than three decades at the paper, she has served as bureau chief in Latin America and in London and as correspondent covering the White House, U.S. foreign policy and the intelligence community.